• Tobacco harm reduction is integral to tobacco control. Harm reduction is a widely practiced strategy in public health (e.g. HIV, drug use, sexual health) and should become an integral component of tobacco control – helping smokers to quit smoking or diverting them from ever starting, and, in either case greatly reducing their risk. • From a health perspective, the major distinction between nicotine products is whether they are combustible or non-combustible. It is not whether they are tobacco or non-tobacco products or whether they are established or novel. Given the principal focus of the FCTC is management of health risks, this distinction should be integral to the design and implementation of the FCTC (We recognise that poor production standards and the inclusion of slaked lime (calcium hydroxide), areca nut and other hazardous ingredients in some traditional tobacco-containing products such as gutka and paan can make these products much more hazardous than other smokeless tobacco products.). • Stakeholders should give appropriate weight to the benefits and opportunities of tobacco harm reduction. They should not focus exclusively on unknown risks to health, especially when these are minor or improbable risks. A lost opportunity for a public health gain represents a real harm to public health, and should be recognised as such. • Youth uptake of any tobacco or nicotine product demands a coherent and adaptable strategy focussed on reducing present and future harms to young people. Policies to address youth nicotine use should be based on an understanding of youth risk behaviours, the interactions between use of different products (for example, for some young smokers the potential displacement of smoking by low risk products may be beneficial), and due regard for the overall balance of harms and benefits to both adults and to youth arising from interventions. • Uncertainty about long-term effects should not be a reason for paralysis. It is true we will not have complete information about the impacts of new products until they have been used exclusively for several decades – and given the complex patterns of use, we may never. But we already have sufficient knowledge based on the physical and chemical processes involved, the toxicology of emissions, and biomarkers of exposure to be confident these non-combustion products will be much less harmful than smoking. We also know with certainty that the incumbent product (cigarette) is extremely harmful. • FCTC and its implementation should embrace “risk-proportionate regulation”. This means that the stringency of regulation or taxation applied to product categories should reflect risk to health. For example, there should be high taxes on cigarettes, but low or no taxes on vaping products. It is reasonable to ban all advertising of combustible products, but to place controls on advertising for non-combustible products (to protect never-smoking youth in particular) and so allow enough promotion so that smokers can still learn of alternatives and can be encouraged to switch. This risk-proportionate approach should be adopted throughout the FCTC. • WHO and Parties to the FCTC should be aware of and careful to avoid the harmful unintended consequences of prohibitions or excessive regulation. If WHO-endorsed policies make noncombustible alternatives to smoking less easily accessible, less palatable or acceptable, more expensive, less consumer friendly or pharmacologically less effective, or inhibit innovation and development of new and improved products, then these policies can cause harm by perpetuating smoking. • The FCTC negotiations should become open to more stakeholders. There are many stakeholders, including consumers, the media and public health experts with pro-harm-reduction views, who should be part of the process. We are concerned that the FCTC has been excluding appropriately diverse perspectives and that its deliberations and decisions could be more robust and credible if its proceedings were more open. We are concerned that WHO and the Convention Secretariat are not embracing these principles and in many cases are doing the opposite. We have seen the more detailed letter to you of 3 September by Abrams et al regarding prohibition and excessive regulation2. 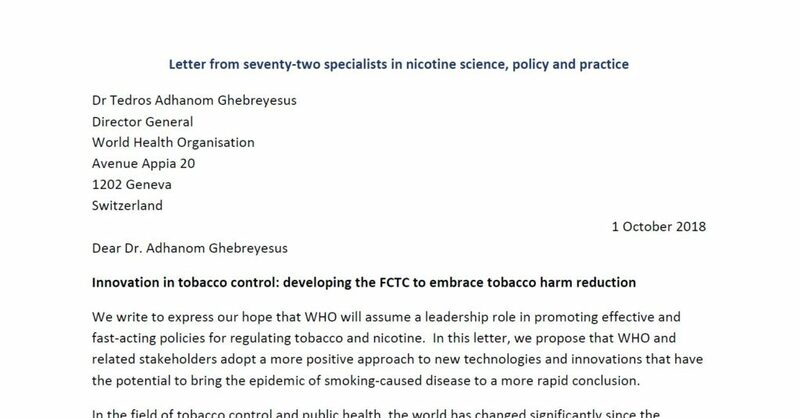 We recommend that this letter be read carefully by everyone with an interest in the future of tobacco control. College of Global Public Health. Honorary Clinical Associate Professor, School of Medicine, University of Nottingham, UK.